Chenille is the French word for caterpillar, and if you look closely at a chenille bedspread you can understand why the term was used to describe these old bedspreads with fluffy tufted yarn. 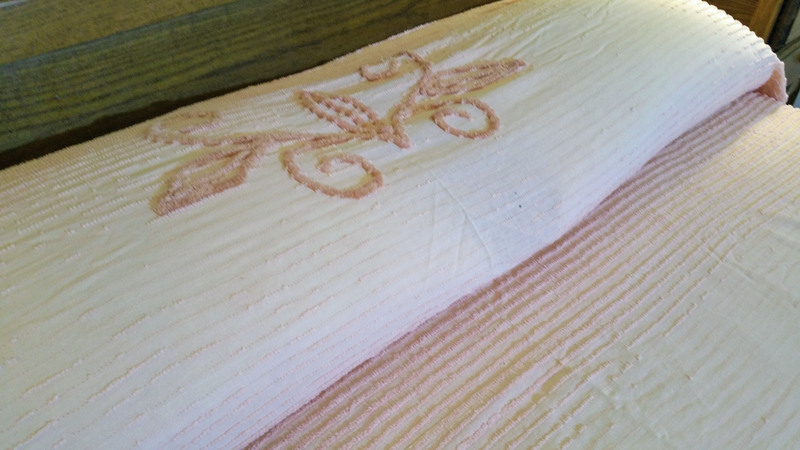 A lady named Catherine Evans Whitener revived this technique in Georgia in the 1890's, giving new interpretation of candlewick bedspreads that were popular in the Colonial day. Hers was a process through which yarn (rather then candlewicking) was pulled through a bed sheet in little tufts. The look grew in popularity and northwest Georgia became well known for this new style of bedding. A cottage industry was born to meet the demand of merchants for this popular new item by the 1930's. Small warehouses and private homes were delivered sheets onto which patterns had been stamped along with piles of yarn that would be pulled through the sheet to create intricate designs. Finishing was done at spread houses, which involved washing the chenille spreads in hot water to shrink them and to lock in the yarn tufts. The peacock is a favorite design of the chenille spreads dating from the 1930's where a stretch of highway 41 that beckoned tourists travelling to Florida to stop and purchase a chenille spread, and this stretch of road became known as "Peacock Alley". Money made from the chenille bedspread industry helped rural families weather the storm of the Great Depression. Of course, industrialization began later and moved this handiwork from rural families into the hands of factories where tufting was done by adapting sewing machines to the task of inserting the tufting. Chenille bedspreads, made cheaper through mechanization, became more affordable and enjoyed their greatest popularity from the 1940's through the 1960's. 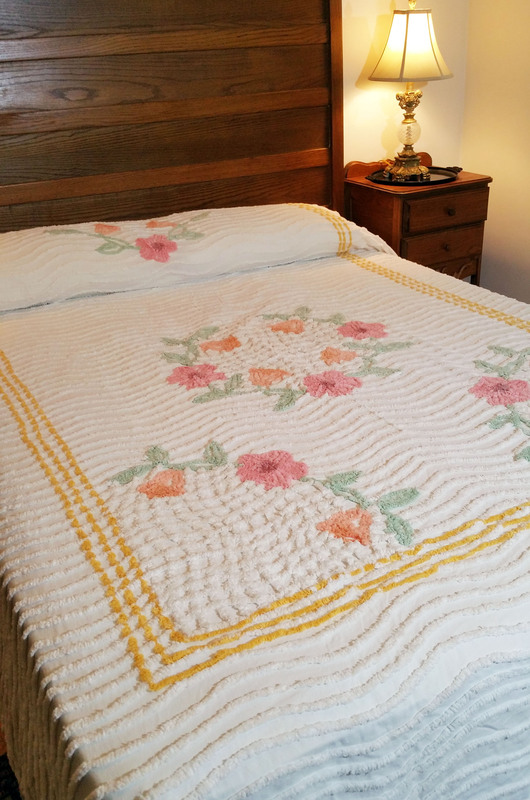 The colors and designs of chenille bedspreads takes us back to a simpler era, and many younger women are rediscovering and using them today as part of their own retro decor. You'll find lots of examples on Pinterest of chenille spreads being remade into pillows, both for the bed and as accent pillows. Be sure to check the bedding section of our Vintage Linen closet to see what we may currently have in stock.